"The heritage style hotel in Udaipur, Chunda Palace Hotel, offers one of the most fascinating stays in the whole state of Rajasthan. 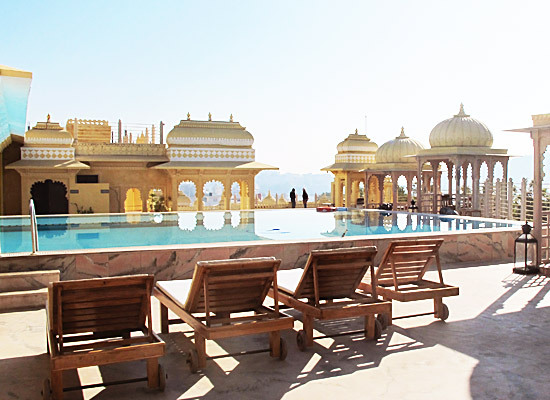 Designed to portray the elegance and charm of Mewar dynasty, the hotel truly gives a royal stay to every guest. The hotel has already earned reputation for its utmost hospitable staff. Guests who stay in here are amazed with the modern conveniences and magnificent views that are on offer for them. 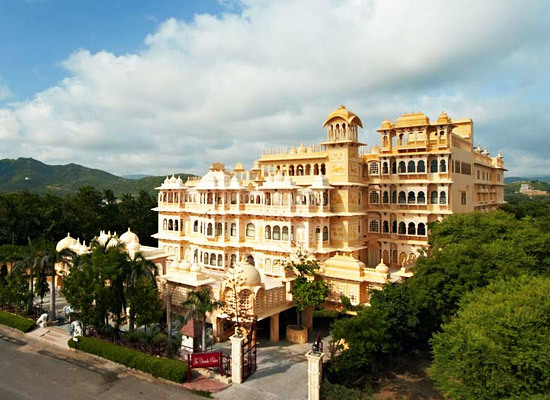 The magnificent heritage style hotel in Rajasthan, Chunda Palace exists as a true spectacle. 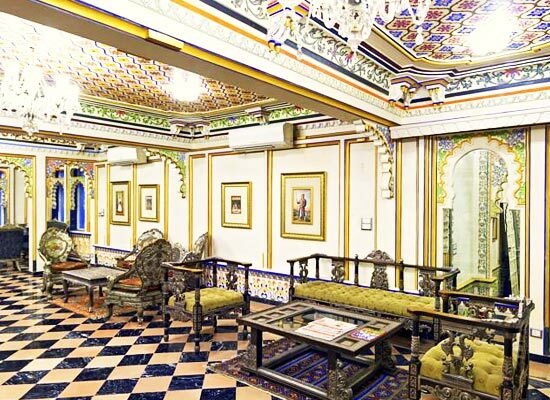 The hotel has been designed with authentic features of Rajasthani Palace. Designed like a noble house of Mewar kingdom, it highlights and exemplifies the rich heritage of Mewar region. It took approximately 16 years to build this spectacle of glorious royalty and architecture. Palace Rooms: There are 30 Palace rooms in the hotel offering spacious accommodations with royal interiors. Royal Imperial Suites: The spacious suites truly showcase the colors and vibrancy of Udaipur. The views offered from these suites are truly beautiful. Historic Suites: These suites are designed using traditional features of Rajasthan and have an extra sit-out from where the guests can enjoy breathtaking sceneries of views Aravali Mountains. 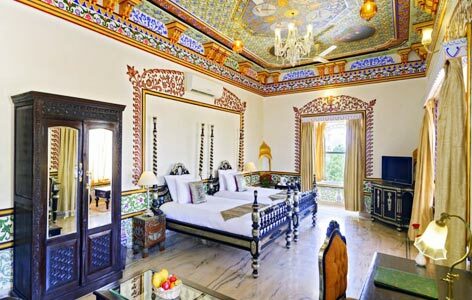 Grand Historic Suites: These extra spacious suites are adorned with elegant glasswork and wall-frescoes that truly sends one back in time to the glorious days of Rajasthan. Rang Tarang: The stylish bar offers wide range of alcoholic and non-alcoholic beverages along with Cuban Cigars. 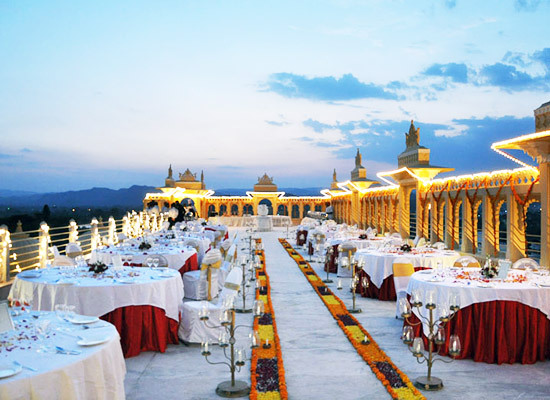 Royal Cuisine: The terrace restaurant at the hotel serves delicious multi-cuisine food and the views of Udaipur that can be seen from here are truly scintillating. Udaipur, The Lake City of Rajasthan, is perhaps the most gorgeous city in the whole country. Situated on the banks of magnificent Lake Pichola, the breathtaking views and gorgeous sceneries all around the city are truly scintillating. Tourists come here almost every day to get lost amidst the peacefulness and tranquility of the beautiful town.